An AC (Alternating Current) induction motor consists of a stator and a rotor and the interaction of the currents flowing in the rotor bars and the rotating magnetic field in the stator generates the torque that turns the motor. In normal operation with a load the rotor speed always lags the magnetic field's speed allowing the rotor bars to cut magnetic lines of force and produce a useful torque. The difference between the synchronous speed of the electric motor magnetic field, and the shaft rotating speed is slip - measured in RPM or frequency. Slip increases with increasing load - providing a greater torque. It is common to express the slip as the ratio between the shaft rotation speed and the synchronous magnetic field speed. When the rotor is not turning the slip is 100 %. Full-load slip varies from less than 1 % in high hp motors to more than 5-6 % in minor hp motors. 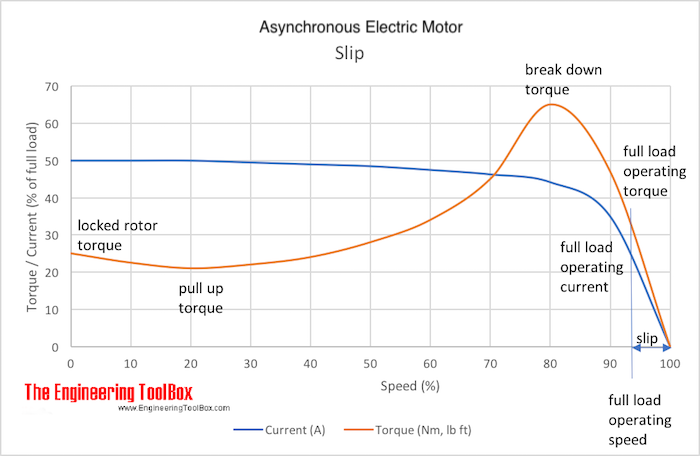 When a motor starts to rotate the slip is 100 % and the motor current is at maximum. Slip and motor current are reduced when the rotor begin turning. Frequency decreases when slip decrease. Inductive reactance depends on the frequency and the slip. When the rotor is not turning the slip frequency is at maximum and so is the inductive reactance. A motor has a resistance and inductance and when the rotor is turning the inductive reactance is low and the power factor approaches to one. The inductive reactance will change with the slip since the rotor impedance is the phase sum of the constant resistance and the variable inductive reactance. When the motor starts rotating the inductive reactance is high and impedance is mostly inductive. The rotor has a low lagging power factor. When the speed increases the inductive reactance goes down equaling the resistance. Electrical induction motors are designed for different applications regarding characteristics like breakaway torque, pull-up torque, slip and more - check NEMA A, B, C and D classification of electrical inductions motors. Engineering ToolBox, (2004). Slip in Electrical Induction Motors. [online] Available at: https://www.engineeringtoolbox.com/electrical-motor-slip-d_652.html [Accessed Day Mo. Year].